Missouri Library Association – Page 9 – a 501(c)(3) nonprofit educational organization operating to promote library service, the profession of librarianship, and cooperation among all types of libraries and organizations concerned with library service in the State of Missouri. Founded in 1900, MLA is proudly beginning a second century of service. Library Advocacy Day is Around the Corner! Tuesday, February 9th is the day to join librarians from throughout the state to meet with members of the state legislature and staff to tell them our story. 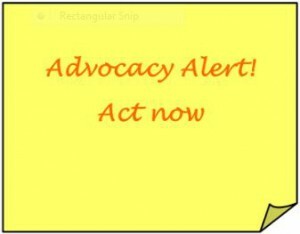 See the Library Advocacy Day page for more information, and some bookmarks and other library graphics available for download. The children of Missouri (and neighboring states) have spoken, selecting Naked!, written by Michael Ian Black and illustrated by Debbie Ridpath Ohi, as the winner of the 2015 Missouri Building Block Picture Book Award. Over 20,000 preschoolers and kindergarteners participated this year. Naked! was the overwhelming choice, receiving 6,078 votes. Digger Dog, written by William Bee and illustrated by Cecilia Johansson, finished second with 3,227 votes. Contrary to popular assumptions, Naked! is not a story about a man’s nightmarish journey into the depths of his soul. Instead, it is a joyous, playful look at a child’s activities after his nightly bath. Our hero runs around the house naked, then runs around the house wearing only a cape, all the while sneaking cookies, before finally succumbing to exhaustion and bed. The Missouri Building Block committee wants to thank all of the teachers, librarians, parents, and caregivers who read to their kids and helped them vote. Your support is what made this such a successful event. 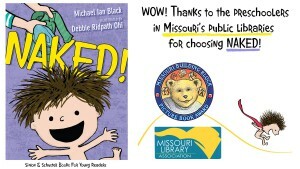 For more information about the Missouri Building Block Picture Book Award program, go to our website at http://molib.org/awards/building-block-award/. View the January 2016 MO INFO! MLA Members: Does a workshop series on presentation skills interest you? The MLA Board wants to know! Take our survey by January 29. Thanks! Registration for Library Advocacy Day is Now Open! The Missouri Library Association will host its annual Library Advocacy Day on Tuesday, February 9, 2016 at the Secretary of State Interpretive Center, 600 West Main, Jefferson City, MO 65101. Online registration is now open. For more information and to register, go to www.mla2016lad.ezregister.com. Don’t miss out on this chance to meet with your senators and representatives to tell them in person why libraries matter in Missouri! Lunch will be provided as part of the registration cost. Questions? Contact Gerald Brooks, MLA Legislative Committee Chair at gbrooks@slpl.org. 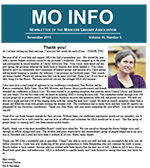 View the November 2015 MO INFO! Library Advocacy Day to Open Soon! The Missouri Library Association will host its annual Library Advocacy Day on Tuesday, February 9, 2016 at the Secretary of State Interpretive Center, 600 West Main, Jefferson City, MO 65101. Online registration opens December 1, 2015. Don’t miss out on this chance to meet with your senators and representatives. Tell them in person why libraries matter in Missouri! October 14 is MO Libraries Snapshot Day! MLA, MPLD, and MASL are asking libraries to post images, videos, and stories about what’s going on in their library this one random day in October. Why? Too many people don’t know what do in 21st century libraries. On 10.14.15, tell your story with images, video, and text. Show that we matter and share stories about how our services touch lives and are relevant to the 21st century. How? Do nothing special. Just record what’s happening in your library. Post those stories to your website, Facebook, Twitter feed, Instagram, or YouTube account. Post it to MLA’s Facebook page if you don’t have another venue. Tag it with ‪#‎molibraries. Take “people pictures,” and have the people in them sign the release form (MLA General Photography Release Form) (Photo Release Form for Minor Children). We’ll do the rest. What happens next? Advocate for libraries! 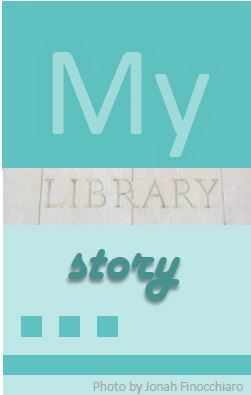 We’ll gather these stories and post them to our Storify site – https://storify.com/MOlibraries. Share the URL with your legislators when they come to visit your library or send it to them and invite them to learn more about what we do on a daily basis. Who can participate? Everyone – all libraries and all activities. We may be public, academic, school, or special. At our core, our mission is the same. Show that mission in action on 10.14.15. MLA is excited to offer a new webinar resource created by Susan Burton at MALA! This 12 minute presentation will introduce you to best practices when engaging your senator and/or representative. Learn how to build a relationship with your state legislators and how to advocate effectively for your library and Missouri libraries. In this short presentation, you’ll learn how to initiate a conversation with your senator or representative, how to phrase your concerns in language and ideas they will appreciate, how to invite them into your library, and ideas on what to show them once they are there. This is a great introduction or refresher for all of us and it’s available free to all MLA members. If you want to learn how to advocate for your library or libraries in general,, or if you just want a refresher course, start here! 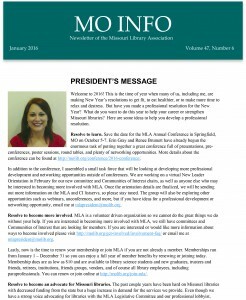 MLA members should watch their email for a message from MLAPresident@molib.org containing the password. Time for Missouri Kids To Vote! Voting for the Missouri Building Block Picture Book Award opens September 1! Here’s the online ballot and the printed ballot. Here’s the 2015 Nominees with activity sheets. Voting will remain open through December 31, 2015.